Munir Moon is a former financial industry executive and a successful small business owner. Moon spent eight years in the financial industry, starting at Chase Econometrics and ending at a savings and loan association during the 1980s. He was a firsthand observer of the financial crisis in the 1980s, which resulted in the demise of the savings and loan industry, to be repeated in 2008 in a different form. Having a son born with cancer who survived numerous surgeries, he has experienced the best and worst of American healthcare system. He is the author of two other books. The first book, The Beltway Beast: Stealing from Future Generations and Destroying the Middle Class, was published in 2014. It transcends the anger and frustration of the American people caused by their leaders’ failure to solve the country’s problems. The book included warnings about cyber security and domestic terrorism by nationalist groups as the most serious economic and national security threats to the United States. The Middle Class Comeback: Women, Millennials, and Technology Leading the Way, counters the negativity of the dominant narrative surrounding the past, the present, and most importantly, the future of the American middle class. It presents a hopeful blueprint for its revival, with women, millennials, and technology being major factors, while addressing the transformation of ever-rising health-care and education costs and taxes that adversely impact the middle class. Moon earned his BS in engineering, MS in economics, and MBA in finance from UCLA. Confessions of an Old Man: How I Am Stealing From Future Generations by Munir Moon reflects the thoughts of an elderly man who looks past his age into what tomorrow holds for his offspring. Working from the premise that what millennials inherit depends on the choices we have made in the past and the choices we make today, he makes a strong case against the contemporary American political landscape and unveils glaring flaws in the system. The author explains how the political scene is structured to rob millennials of their future and plunge them into a life of misery, being on the receiving end of the repercussions of the decisions made by today’s politicians and decisions inspired by sheer greed. The author makes readers understand how society cares less about the legacy it leaves to future generations. The tone in Confessions of an Old Man is strong, filled with rage — and rightly so — and the author comes across as informed and very insightful in his message. His arguments are backed by clear references, which even feature some Tweets, memos, conversations, and documents by or relating to key decision makers in the United States. 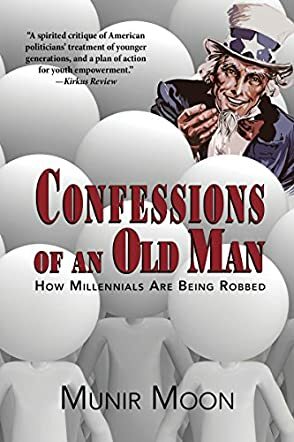 This book should be perceived as a wake-up call to right the wrongs the generation before this one and the present generation are doing to the future of millennials. It’s a very realistic, prophetic statement about what we’ll leave to those who will come after us. Confessions of an Old Man: How I Am Stealing From Future Generations by Munir Moon is a call to action. Focusing on the Millennial and so called iGen generations, Moon posits that these generations have the most to lose if the United States continues with its current economic course. Munir points out that they are currently paying entitlement that they may not get to enjoy once they reach the age that the Baby Boomers are now, and as such they have a right to demand a say in their future. Putting most of his focus on the federal sector by calling Washington D.C. the Beltway Beast, Moon points out that an amalgamation of economic, racial, and political disparities have led us to where we are today - from the ballooning student debt, to the healthcare crisis, and national debt. He is careful not to blame either party as he points out that this is a beast at least thirty years in the making. But Confessions of an Old Man: How I Am Stealing From Future Generations by Munir Moon is not all doom and gloom as he offers practical solutions and injects a fair bit of hope into the narrative. I found Confessions of an Old Man by Munir Moon to be well written and informative. As a Millennial myself, I was aware of a lot of the things Moon mentions in the text, either because of its direct effect on myself or my peers so it was great to encounter a book that 'got it' but also managed to offer a moderate political approach. Overall, it is written in a way that makes for easy consumption and understanding his insights on the way we think about healthcare and how it is to our detriment was enlightening, to say the least. Moon has proven his writing to be a much needed resource. His book is short but impactful and provides numerous tools in the appendix as a call to action. In the introduction to Confessions of an Old Man: How I Am Stealing From Future Generations, Munir Moon greets the reader with a startling statement, and rightly so: “I am full of guilt, frustration, and anger, and feel helpless as I turn sixty-five with three millennial sons.” This is because the present political systems continue to rob the millennials, with policies that gravely affect their future. Moving from Regan through Bush to the current president, the author demonstrates how political leaders and Congress have skyrocketed the US national debt and even states that Trump’s presidency could bring it to $3 trillion by 2020. The author shows how this generation robs from the young with impunity. From the implications of tax cuts for corporations to profiting from student debt to the glaring inequality of equal men to costly policies, the author illustrates with powerful arguments and facts the glaring errors of a system that will leave a very lame legacy for the future. But it’s not just about that: this book offers a path to reversing the tragedy into which the current political system is about to plunge our young people. This book is designed to provoke reflection, filled with interesting and important questions such as: “Why is the working income taxed at a higher rate than nonworking income?” In a style that is clear and prose that is crisp, the author uses a compelling and bold tone to give readers the facts of how much we hurt the future generations. There were moments where I had to stop and wonder how we got here. I had to ask myself if we would even have had a world to inherit if our forebears had lived the way we do. Confessions of an Old Man: How I Am Stealing From Future Generations will instill in readers the consciousness that is fitting for this age. Confessions of an Old Man: How I Am Stealing From Future Generations by Munir Moon is a non-fiction book that summons Millennials - the MI Generation - to mobilize for a shift that the Boomer generation (and to some extent, the Generation X'ers) are leaving as their political, environmental, and financial legacy. It's a guide that offers a no-holds-barred analysis on how the United States became a nation riddled with debt, student loans, limited and expensive healthcare options, inequality, war, and nuclear "leadership." Moon takes a fatherly approach in his narrative, offering solutions for the fact-based and figure-heavy problems he feels some responsibility for as a Boomer (although he hardly comes across as complicit). Swift and to the point, Moon writes with clarity and optimism without the unnecessary sugar coating that might detract from what he has to say. And my goodness, he sure has a lot to say. In a time where many Millennials feel empowered by our collective voice, but at the same time tied down by archaic mindsets and the invention of hyper-patriotism intended to shame and silence us, Confessions of an Old Man: How I Am Stealing From Future Generations by Munir Moon calls us to dig deep and press on. While it may be too late for past generations to back peddle, it can be the dawn of a new age for the most educated (and as a result, the most indebted) generation to inherit the sins of our fathers. The Millennials have their work cut out for them, but with the wisdom of authors like Moon, we're a long way from lost. Confessions of an Old Man: How I Am Stealing from Future Generations by Munir Moon is an eye opener of a book in which he talks about things such as global warming, poor healthcare systems, expensive necessities of life, and leaving children in a cold, cruel world. At first glance, the book seems to talk about the things we hear on the radio and news channels, but as I read further, I realized that the author was going much deeper than I thought he would. Munir Moon talks about how the Millennials are under great pressure because they have to make do with what they have. The Millennial generation is paying the price for not having a say in their future, having to make do with the current situation of the country, and trying to find a way to make it work, even though the future seems so bleak. What I appreciated most about this book is the fact that the author effortlessly talks about these hardships while at the same time emphasizing how this has the potential to become too much for the Millennial generation. The flow of the book was great and the narrative was simple yet powerful. I felt that the book kept a pace that will be appreciated by most readers. By keeping up with the flow, Munir Moon ensured that the reader would not get bored and he built up the interest as the book progressed. This was an informative and thought provoking book that made me think of things that I never thought of before. As a Millennial, this was very interesting and made me reflect on many things I did not even know existed.